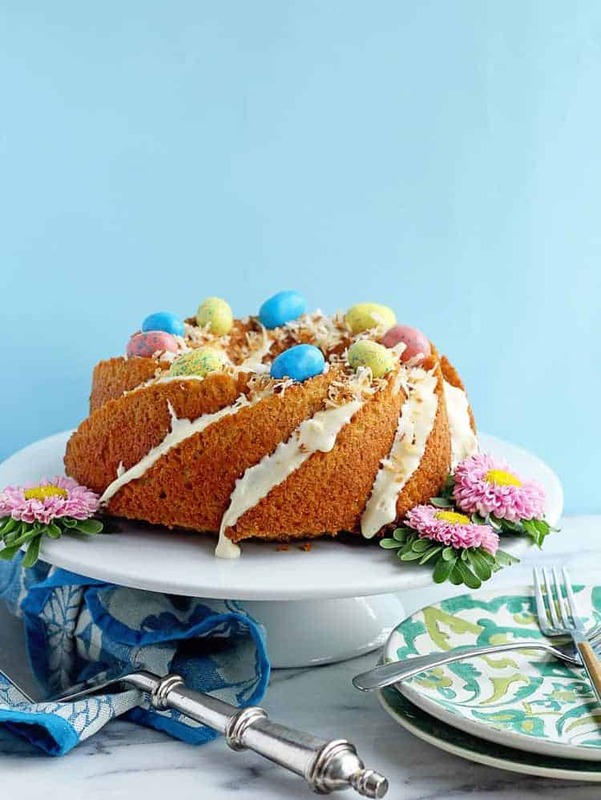 Easy Carrot Cake Recipe – Delightful and easy, this Carrot Cake Recipe, made with McCormick®, gives a new twist to the classic Easter dessert in pound cake form. This post was sponsored by McCormick®. All opinions are 100% mine. Spring is here, at least the calendar says so. Chicago’s weather, although slightly warmer which I’m appreciating, has still been very gloomy and the trees remain bare. I’m patiently awaiting the arrival of green grass and warm breezes so I can finally tuck away scarves and heavy coats. If you live in Chicago, you know that seasonal changes happen abruptly. One day you’re laying out by the lake feeling the hot sun on your skin and by the end of the week leaves are changing color and your sweatshirts have wriggled out of the closet. So as we pass by the last few days of what seems like Winter, I take comfort in the fact that Spring is right at my fingertips. When I think of Spring there is one thing that immediately comes to mind: Easter. Bunny rabbits, Cadbury Eggs, colorful baskets and freshly pressed church clothes all flood my thoughts. I start seeing everything with pastel colored lenses and the smell of phantom tulips waft in the air. Easter holds a special place in my heart because like most other holidays it’s a time when my entire family comes together. Every year we gather for an Easter Sunday lunch where the table is full of delicious food. The adults sit around the table filling their plates while the children dye eggs and decorate sugar cookie bunnies. The room fills with laughter, love and light but at the center of it all are the recipes we love to enjoy together. 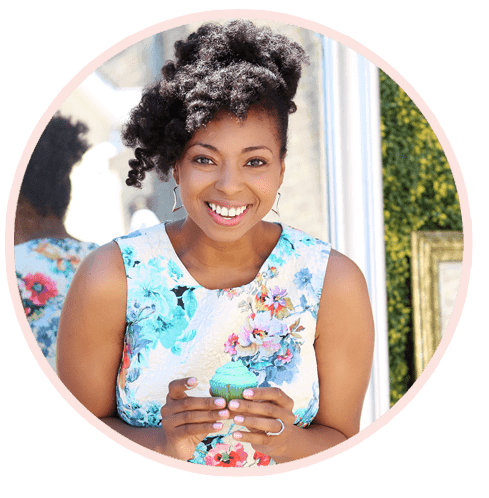 All of us contribute to the meal whether it something small like refreshments or an entire vat of collard greens. As I’m sure you guys could’ve guessed I love to bring dessert. One of my favorite things to make for Easter is a Classic Carrot Cake. You truly can’t go wrong. We’re talking cream cheese frosting, a perfectly spiced cake with nuggets of carrots, walnuts and raisins. Frost one big carrot on the top and all of a sudden you’ve got the centerpiece for Easter dinner. But this year is a bit different because we’re putting a twist on it ya’ll. 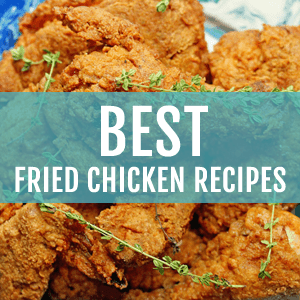 Classics done in new and exciting ways are my favorite recipes. For Easter, we pull out our classic carrot cake recipes and make them without breaking a sweat. This year, however I wanted to switch things up and create a new carrot cake recipe in the form of a pound cake. A majority of the recipes we use on a daily basis have been adapted a million times over. One of the beauties of baking is being able to create original versions of a classic and not knowing if you yourself have created a new classic. According to food historians, our modern carrot cake most likely descended from medieval carrot puddings enjoyed by people in Europe. During the middle ages sugar and other sweeteners were difficult to come by as well as expensive. People, especially in Britain, began to use carrots as a substitute. Weird, I know. Eventually our version of carrot cake was born and boy, am I glad that it did. Sometimes the fuss of making a layer cake is a little stressful to tell you the truth. Making sure the layers are just right and frosting it to near perfection is more anxiety than I need this time of year. 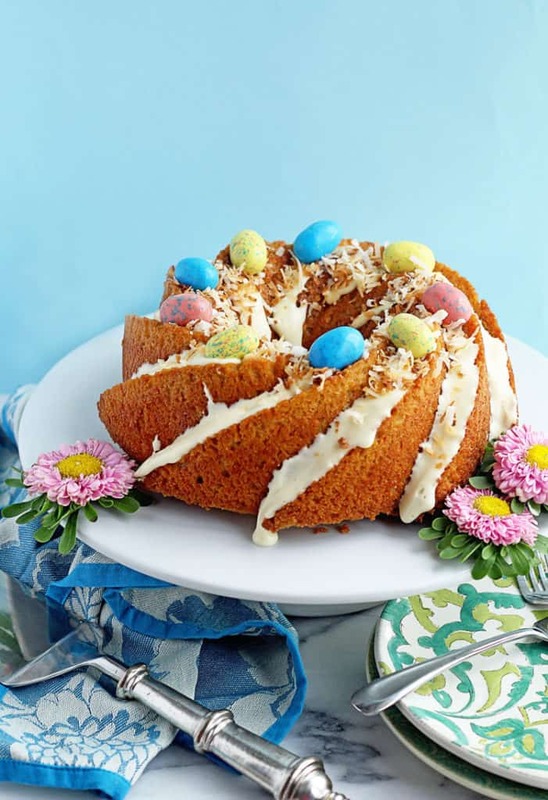 This is exactly why my new Easy Carrot Cake Pound Cake Recipe, made with McCormick® spices and vanilla, should be the recipe you reach for this Easter holiday. This is hassle free; it’s all ease and totally delicious. This cake batter recipe doesn’t even require a mixer! WHAT’S CARROT CAKE MADE OF? With the help of McCormick®, this recipe has all the flavors of a traditional carrot cake you adore. Ground cinnamon, ground nutmeg and ground cloves all help to make this cake perfectly spiced. 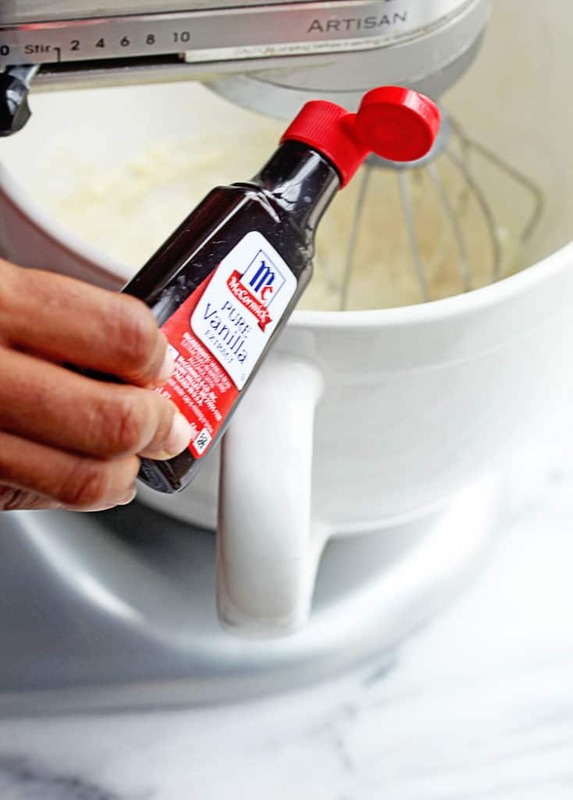 A hint of pure vanilla extract whispers through the cake batter. This Easy Carrot Cake Pound Cake Recipe gets more heavenly with every single bite. WHAT MAKES THIS CARROT CAKE RECIPE DIFFERENT? To top it off, I added an easy orange and vanilla flavored cream cheese icing that pairs perfectly with this cake. I garnished the top with toasted coconut and fun robin egg candies. They took the presentation over the top. You don’t need an intimidating carrot layer cake on your Easter table this year. This easy carrot cake pound cake recipe will definitely get you in the Easter mood in no time without all the fuss. If you like this Easy Carrot Cake Recipe, you’ll also like some of my other easy Easter cakes. 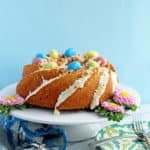 Easy Carrot Cake Recipe - Delightful and easy, this Carrot Cake Recipe, made with McCormick®, gives a new twist to the classic Easter dessert in pound cake form. In one large bowl, whisk together shredded carrots, granulated sugar, sour cream, oil, beaten eggs, and McCormick vanilla extract. In a separate bowl, sift together flour, baking powder, baking soda, salt, McCormick ground cinnamon, McCormick ground cloves, and McCormick ground nutmeg. Slowly add the dry ingredients to the wet ingredients and whisk together until well incorporated. Add the batter to a non-stick sprayed 10 inch bundt pan and bake for 45-55 minutes or until a toothpick inserted into the center of the cake comes out clean. Allow the cake to cool for 10 minutes in the pan then turn the cake out on a cooling rack to cool completely. Add cream cheese to your mixer (or use a hand mixer and medium size bowl) and mix on medium high speed. Turn mixer down to slow speed and carefully add in confectioners sugar in two separate intervals until incorporated. Next add orange juice and McCormick vanilla extract and mix until smooth and pourable (add a little bit more orange juice if you want the icing a little looser or until you get the consistency you prefer). Drizzle icing over top of cooled cake. Optional: Garnish the top of the pound cake with toasted coconut and robin eggs and serve. Can I use 2 loaf pans instead of the bundt pan? Love this. Definitely adding to our table this Easter! Hooray I hope you enjoy!! Update! Made this for Easter, the cake was so moist and perfectly spiced. The orange cream cheese icing was really good too. I might opt to add a little more powdered sugar to the icing next time so it’s just a little sweeter. Currently trying not the eat all the leftovers in one day, it was a winner! Looks lovely! Just a question on the icing – you say a package of cream cheese – what size package? Hi what a lovely cake, can I use pineapple, nuts, raisin in this cake? If so how much. Yes you can but you will have to play it by ear since I did not test it with those items. Just add maybe 1/2 a cup of items and then see how it bakes and see if it makes a difference it taste before adding more the next time. I had tried this once.. Its an awesome recipe dear…i think your ingredients have some difference with what i had.. sure i will check this out. 🙂 as an evening snack tomorrow..
Yummy! It looks delicious! I love this cake! 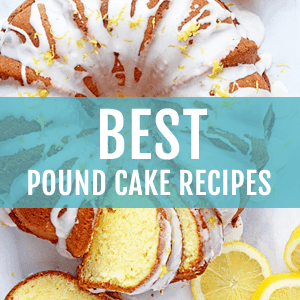 Oh wow, I love the idea of a carrot cake pound cake! Jocelyn this looks absolutely stunning, and that orange-infused glaze sounds divine! What an amazingly gorgeous cake for Easter! I’ve never had a carrot pound cake before. It sounds incredible! Darn girl! What a stunning cake!! Bundt cakes are a breeze and so tasty with that frosting cascading down the sides! Carrot pound cake?! this is brilliant and perfect for Easter! love!! Layer cakes do give me a bit of anxiety, so I love doing bundt-style cakes! This is such a wonderful twist on classic carrot cake and I love the sound of that orange cream cheese glaze. I just might make this on Easter — it would be just perfect! 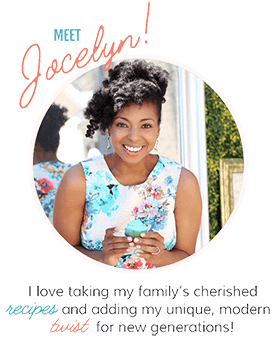 Totally gorgeous Jocelyn! The star of the Easter dessert table for sure! Thank you so so much Mary Ann! I love Granny pound cakes the best! Yes, yes and yes! I TOTALLY agree that making a layer cake is stressful! I can’t take it sometimes. LOL! And yes, what a beautiful alternative! I just love this! Same here!! Thanks so much Kelley! Your cake baking skills make me so happy. This carrot cake is no different. I need it in my life! I adore this cake you created. So cute for Easter!! Such a pretty cake, Jocelyn! Easter perfection! What a great cake for Easter! Carrot cake is my all time favorite, hands down. I definitely need to give this version a shot! This is the most gorgeous carrot cake I have ever seen! Love it for Easter! 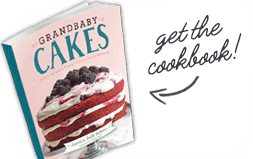 I’m sucker for some good carrot cake and this cake sounds incredible not to mention how gorgeous it is! ? I have a love for traditional carrot cake with cream cheese frosting, but I love this pound cake twist. Prettiest carrot cake ever, and I love how simple it is! Carrot cake meets pound cake?! Sign me up! What a beautiful cake! I agree with you! The ease of pound cake is just wonderful. Love love this classic revamp in carrot cake. Thank you so much! It was so fun to bake! This is gorgeous and so festive! I want to try it! I love how easy it is to make too! This is absolutely gorgeous! I love carrot cake and yours is beautiful in this Bundt pan. Perfect for Easter dessert! What a gorgeous cake! 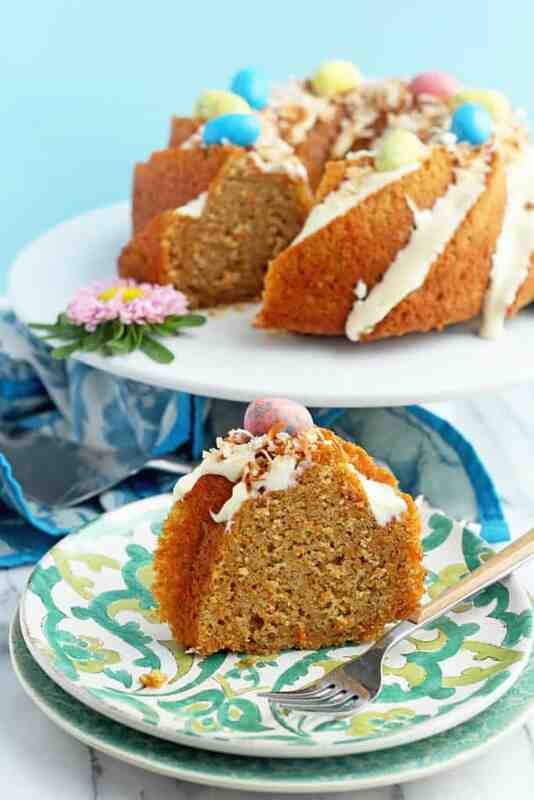 I love carrot cake and adore how you used a Bundt pan for this! Beautiful! Such a perfect cake for Easter! I love that you turned classic carrot cake into a pound cake! You are absolutely right that all the layers and frosting can make regular cake a little fussy. Make it in the bundt pan looks easier and I love the swirls! Hooray! Thank you so much darling.